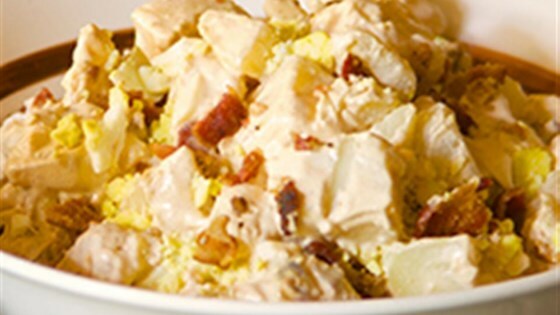 "Combine TABASCO® Chipotle Sauce with bacon to make a smoky potato salad that's full of flavor." Place potatoes in a large saucepan and cover with water; add 2 teaspoons salt and bring to a boil. Reduce heat to medium; cover and cook 12 to 15 minutes or until potatoes are tender. Drain and cool. Meanwhile, in a small bowl, combine sour cream, mayonnaise, TABASCO(R) Chipotle Sauce, mustard, and garlic; mix well. Place potatoes in a large bowl with bacon and eggs. Add dressing and toss to coat. Season with additional salt, if needed. Cover and refrigerate. I originally had Chipotle potato salad while traveling. After returning home I searched and found this recipe. Made it loved it. Best served warm. This potato salad is incredible! I doubled the batch to make enough for 8-10 people.